As readers of our blog will know, we have been supporting Kenyan agricultural start-up, iCow, for a while. Yesterday, they announced the details of their partnership with leading mobile operator Safaricom. Here is our take on iCow’s journey to date and our thoughts on this partnership. 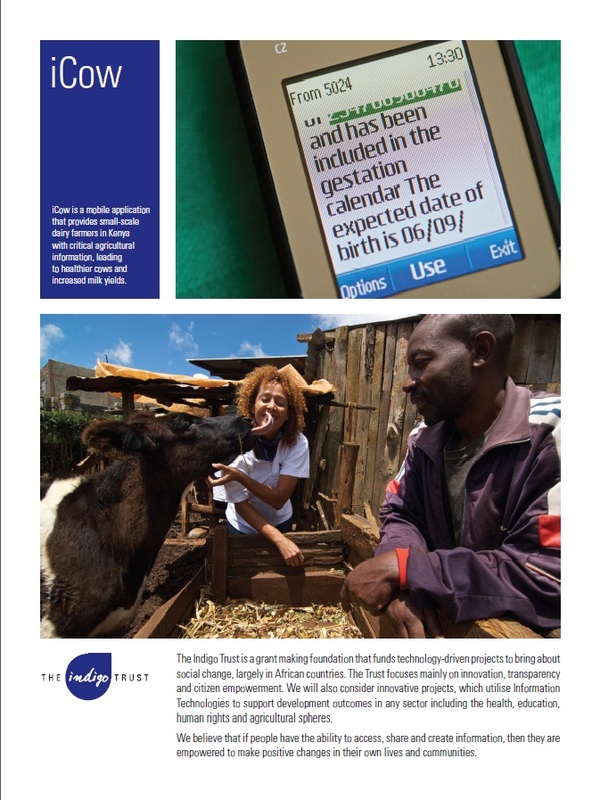 Our Executive Loren Treisman said ‘The Indigo Trust first came across iCow when it won Apps4Africa in 2011. At the time, we had just developed a new strategy focusing on supporting technology driven projects which bring about social change in Africa. We immediately saw iCow’s potential to yield results for millions of dairy farmers in Kenya. We thought it was an ingenious idea, one which farmers in the UK could benefit from too! We’re strong believers in the power of information to empower people to make positive changes in their own lives and communities and iCow seemed to have the potential to do just that. We loved the fact that the system was based on simple, SMS technology which could be easily accessed by the majority of farmers and that it used local languages. What’s more, its Founder Su Kahumbu’s passion, drive and in depth agricultural knowledge made us feel pretty convinced that this was a project worth backing. The Indigo Trust has awarded £65,228 or over £8.5 million Ksh to iCow in total, which has contributed towards core costs, legal fees and crucial customer care support. This has enabled iCow to provide critical support to farmers and also learn from them in order to improve the platform. We’ve been delighted to watch iCow grow from strength to strength. Users of the platform repeatedly report increased milk yields, decreased diseases in their cows and better sale prices for livestock. Farmers all say that they are extremely willing to pay the small price to use the service as their incomes have increased once they use the platform, leaving them more to spend on themselves and their families. We are extremely excited to see them launch on Safaricom today. This should enable iCow to scale right across Kenya alongside a trusted brand, which should have a massive impact. We hope that this will contribute to Kenya’s economic development by increasing milk yields and that it will improve the livelihoods of thousands of families across Kenya who will now have increased income to spend on crucial things like education and healthcare for their families. We’re also really excited to see a social start-up partnering with a mobile operator. We believe that this is a model which should be adopted more widely, as it brings benefit to both parties and is a fantastic way to contribute to social and economic improvements to a country in a sustainable way, which doesn’t depend indefinitely on aid or grant support.